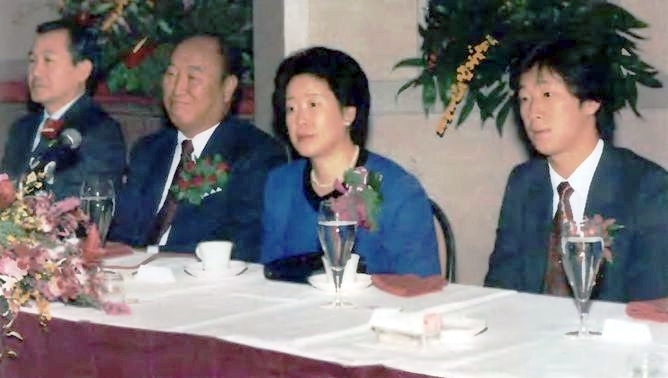 True Parents and Hyo Jin Nim at the VIP dinner at ICUS XVI. Question: How and why did ICUS start, and what is special about it? 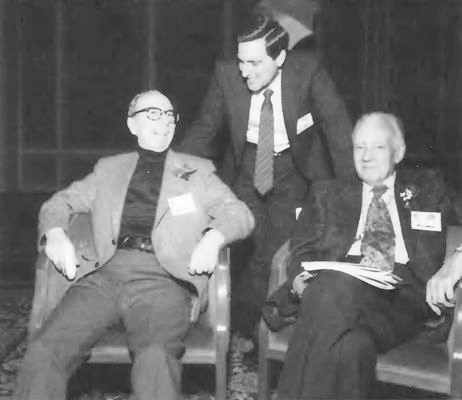 In 1972 an American scholar by the name of Edward Haskell thought of holding a conference for the purpose of unifying all thought and all sciences. Father heard about his idea and decided to support him, because he seemed to be a person prepared to fulfill a goal that Father had envisioned many years earlier. At that time there was hardly any financial base in America, and the organizers had to search hard to find the funds to support this conference. It finally took place in the prestigious and traditional Waldorf-Astoria Hotel in New York. Twenty participants attended from eight nations. There were no other similar international projects for scholars at that time. PWPA had only just begun in Korea in 1968 or 1969 as one of Father's first initiatives to bring Korean and Japanese scholars into dialogue. Most academic conferences are held only within one certain discipline. Father's thinking is that in order to actually solve the world's problems, people have to look at the whole world and each problem from the perspective of every aspect of human life. For instance, an issue such as solving the problems of large cities is not just a sociological issue; it is also a religious, cultural, political, educational, technological, economic, and moral issue. At ICUS, scientists and scholars come together from different nations, different cultures, and different disciplines, and are forced to tolerate each other and listen to each other. Hopefully, they come to respect each other's point of view. With this kind of diversity, it is incredible what ideas they can come up with! Trying to understand the validity of all the others' perspectives compels each participant to be humble and to realize that he understands only a part of reality, and not the whole of it. That is why the participants are so excited about ICUS, and why it is so unique. Those chosen to be committee chairpersons (there are usually about seven committees at each ICUS) create their committees in the manner they think best, within the scope of the two ICUS themes: "Science and Values" and "Unity of Knowledge." We provide the vision and the support; scholars who resonate with that vision provide the expertise, theories, and knowledge. ICUS gives the scholars an opportunity to do a project that they may have wanted to do for a long time, but for which they never had the means. In a sense, we give them a grant and a forum in order to allow them to fulfill their goals. Question: Why do you think Father always attends these conferences? Father respects and appreciates scholars because, by the nature of their professions, they are searching for truth, not for money or power. The ideal of academia is to seek truth for the sake of truth itself, and to apply truth to create a better world. Scholars are on the "cutting edge" of progress. Throughout history, scholars have endured persecution from the churches, the established academic community, and society, all of which often did not like to hear about new ideas. Father wants to be at every conference so that he can nurture, inspire, and pray for the participants. Every year the scholars receive a little more insight from True Parents as to how all scholars can work together to bring about world peace and the betterment of humankind. Father really loves the scholars a lot. In fact, True Parents as well as the participants feel that ICUS is like a large family. Father recognizes a purity in scientists and scholars that businessmen, politicians, and other "technicians" of society do not always emulate. Scholars are also a central concern for Father because he sees them as pioneers in building the substantial, technological Kingdom on earth and as the ones who will educate the coming generations. In the future, some of them may even be invited to teach at the new international university that is being planned, a project being partially developed out of ICUS. This international university is envisioned to have campuses all over the world. The professors who will teach in these schools will be those who have been involved with ICUS and are seeking a truly interdisciplinary, international, and value-oriented approach to educating future world citizens. We see God as the author of truth, so if these scientists are really searching for truth, one day they will logically come to a point of collision with its source and will recognize that God exists. This is especially evident in the physical sciences. Many physicists are almost willing now to accept the idea that something other than this physical world must exist. Social scientists, especially the psychologists and sociologists, tend to be atheists or agnostics. Biologists also are less apt to accept the possibility of a God, since they feel that they themselves can manipulate life. Various polls and surveys lend evidence to support this. Nevertheless, Father brings scholars from all disciplines -- including those in the fields of religion, philosophy, culture, and the arts -- to dialogue, in the hopes that they might all discover the source and unity of truth. Dr. Richard Rubenstein shares with True Parents at the VIP dinner during ICUS XVI. To his right is James Baughman. 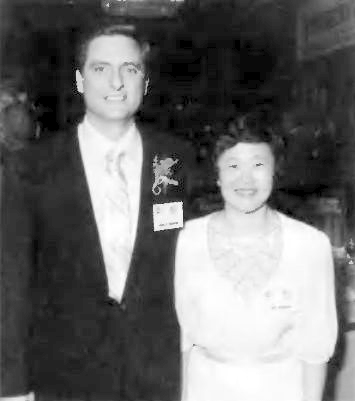 To his left is his wife, Mrs. Betty Rubenstein. Question: How has the size of the conference evolved? When ICUS began, the organizers sent hundreds of invitations just to get a few participants to come. Now it's just the opposite; I get stacks of letters from people saying that they want to come to ICUS. 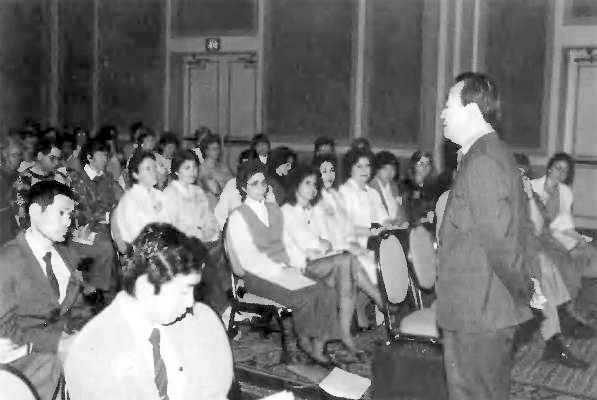 From 1972 to 1981, the conferences became larger each year, although in 1974 and 1975 there was a drastic drop in attendance by Nobel laureates and key participants because of negative American publicity about the church. But some scholars, such as Eugene Wigner, Sir John Eccles, and Robert Mulliken kept coming despite the adversity. 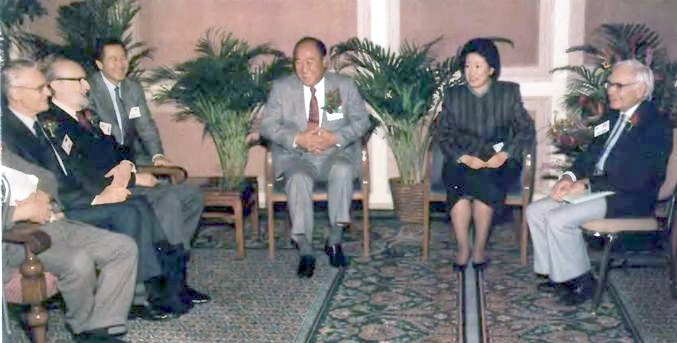 In 1981, the conference in Seoul had about 1,000 participants. After that, the scholars suggested a maximum of about 220-240 per conference. They wanted it smaller in order to have more serious work sessions. It was difficult to have a focused discussion with 300 people sitting in a room, but now, with committees of 30-35 people, you can have a pretty decent discussion. Each conference is composed of about 50 percent new participants and 50 percent returning attendees. A lot of key scholars still do not come to the conference because of prejudice against Father and the church. One of their excuses is that they feel they will have no academic freedom at the conference. But in fact, ICUS provides a forum for greater freedom than what is often found in their own conferences or those sponsored by other groups, which always have certain set agendas. Participants often tell me this, and I have experienced the biases myself at other professional meetings. At ICUS, no one group or stance controls the meeting. Question: How did the process of organizing each conference develop? In the beginning it was very difficult to clarify for the participants the internal goals of ICUS. During the first few years, Father gave us only a general goal to fulfill. Nevertheless, he consistently spoke about absolute values and the unity of the sciences in his annual Founder's Address. The theme of the first ICUS was "Moral Orientation of the Sciences!" Following that, the themes were: "Modern Science and Moral Values." "Science and Absolute Values," "The Centrality of Science and Absolute Values," "The Search for Absolute Values" and "Harmony among the Sciences!" For many months, Glenn Strait and I studied Father's talks and asked Rev. Kwak a lot of questions. Based on this research, we identified the two themes that seemed to be recurring constantly throughout ICUS: "Science and Values" and "Unity of Knowledge!" After that we could explain these themes to the committee chairpersons so they could develop their committees around them. 2) to focus on absolute values and to try to find ways of solving the world's problems based on those values. We developed a handbook for participants, explaining their responsibilities. We made it such that everybody who was invited to ICUS had a specific role, either as a paper writer or as a discussant. It was not difficult to find participants who were committed to do their work seriously in the context of the main themes. A relatively recent development is that we now start working on each ICUS meeting a year and a half beforehand. In the past, the organizers had less than a year to put the conference together. As a consequence, some of the best people could not always attend because they had already scheduled things two or three years in advance. Also those who did agree to write papers could not always produce the best quality in the short time provided. The short preparation time also made it difficult for the core ICUS staff or secretariat, and the support staff to do anything except handle the technical details, like hotel reservations, flights, etc. There was no way we could adequately help in the internal development of the ICUS committees. But it was important for us to develop a professional relationship with the scholars so that they would look at us not just as their secretarial help but as colleagues. Fortunately, we now have a conference services department to deal with the hotel, meals, and travel, so that the secretariat can focus more on the program development of the conference. Rev. C. H. Kwak gives guidance to the staff of the 16th ICUS. Question: How are the committee topics chosen? One of the most important aspects of our growth was the creation in 1985 of a Planning Board, composed of 15 scholars from past ICUS participants. The Board is chosen by the ICF Board of Directors and is designed to create an international, interdisciplinary body that can give recommendations and pass on to the participants a clear understanding of the meaning of the ICUS themes. The Planning Board recommends the programs, committees, and topics for each conference, but the ICF Board of Directors, chaired by Rev. Chung Hwan Kwak, makes the final decisions. All Planning Board members have a three-year term, and the terms are staggered, which means that five new people come in every year. This way we create an ever-growing circle of core scholars who will support and guide the ICUS project. The Planning Board is concerned with three areas: 1) organization of each conference; 2) publications such as the International Journal on the Unity of the Sciences, and 3) long-range goals and research, such as finding new participants, new sources of income, and new ways to promote ICUS. So far we have been quite fortunate to have very good people serve on the Board. In the late spring of every year there is a Planning Board meeting to plan the ICUS for the following year. 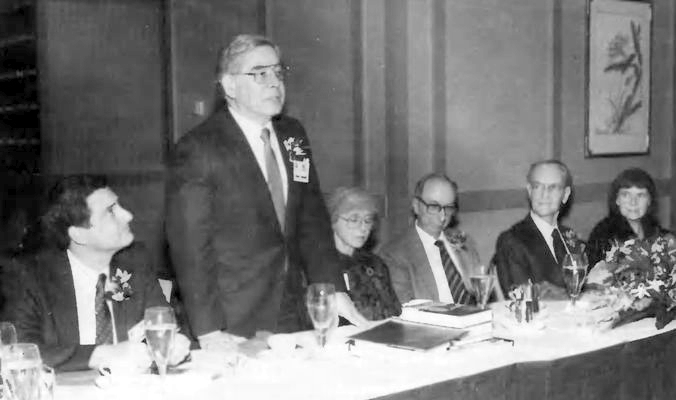 This spring we will plan the 1990 ICUS, since we will now hold the conference once every two years. Before this meeting, we send out about 70 invitations to top scholars who have shown interest in being committee chairpersons, and ask them to propose a committee topic based on certain guidelines. From the responses, the Planning Board recommends the next program and the seven committee chairpersons. There is always a lot of discussion in the Planning Board meeting about what combination of topics would be best, to make each ICUS as a whole a good conference. Father has asked that every year we have one committee on the environment, one committee on ecumenical philosophy, and one committee dealing with the broad issue of "religion and science,' or "spirit and science." Father trusts the Planning Board to come up with the right people and the right program. And he trusts us, the secretariat, to give all the participants the insight and background they need to be able to fulfill his vision. At our spring meeting we discuss in depth the ICUS vision and how to advance its themes in future meetings and projects. In order to encourage the participants to write papers and committee proposals with the two themes of ICUS in mind, the conference organizers themselves first need to recognize the importance of the two themes. Dr. Kenneth Mellanby, among others, did much to remind participants who got off on a tangent to consider how their topic contributes to the main themes. The committee chairpersons have to lead the way. We hope that by following their leads, the paper writers will not only contribute to the themes but will also connect in heart with Father's vision for ICUS. When the committee chairpersons are chosen, they themselves invite the other participants. We assist in providing names in order to help them develop an international committee. We send various committee proposals to the missionaries around the world who serve as ICF representatives, and ask them to recommend PWPA contacts or other scholars from their countries. Father always chooses the overall conference chairperson, usually someone recommended by the Planning Board. He decides what the annual theme will be, and he also chooses the conference location. The secretariat suggests several places, but Father usually comes up with another that turns out to be just right. Every year at the end of ICUS we publish an annual report. Its purpose is to keep participants connected, especially since many are not able to attend the conference each year. It also contains a call for papers and an advertisement for the ICUS Journal and other ICUS publications. Mother took a huge drumstick and placed it lovingly on Father's plate. It was really very cute. Question: How do you decide when a conference is a success? What do you do spiritually and physically to try to make it a success? We had great success at the 16th ICUS in Atlanta in that a large majority of the conference papers addressed the two ICUS themes in very serious and sincere ways. Now we want to encourage everyone who participates to contribute seriously to the themes. Many of the professors are actually taking the responsibility of ICUS upon themselves, and they are ready to work very hard to fulfill the ICUS vision. Father got very excited when he heard this! However, he said we have not done enough yet. He said that if these people just shake Father's hand and use the ICUS resources for their own purposes without knowing enough about Father, they will have deepest regrets in the future. He said that we have to dialogue with them now more about the spiritual world and the need for the unity between religion and science. Question: What does the ICUS staff pray for? Every year, we pray for the success of ICUS and the protection of Father. We pray that Father will have a good experience, that he will be inspired by the environment at each ICUS location, and more so by the dedication of the participants. We also pray to find opportunities for the scholars to do something for Father, knowing that they want to express their appreciation for the Founder but are not always sure how to go about it. (We usually suggest some kind of gift or plaque, but we let them decide.) The secretariat is, among other things, in a position to present Father to the scholars and the scholars to Father. Their deep regard for him and his vision is what we pray for each year. In the early years, when the ICUS headquarters was at Belvedere, the staff would go out to the Holy Rock and pray every night. Even though our office is now in New York City, we still sometimes go to Belvedere and pray for several hours until midnight in order to connect with that tradition. We were fortunate that Heung Jin Nim arrived in New York the weekend before this last ICUS. We had a profound experience with him that we did not expect at all. We were determined to take that spirit to ICUS, and we kept Heung Jin Nim's schedule all the way through. I believe strongly that because of that effort in prayer and in keeping the schedule, ICUS was a great success this year. Many of the scholars expressed that this year was their most beautiful experience at ICUS so far. Father also seemed very excited and happy, although he is never fully satisfied, because he knows we can always do more. Through our prayers, we paid indemnity and laid the foundation for all the participants to come into a greater harmony than they had ever experienced before. I think Father was inspired to see that we had reached a different level. Question: How often do students in universities have this kind of experience with renowned professors from all the world? Father really loves the scholars a lot. In fact, True Parents as well as the participants feel that ICUS is like a large family. Question: You have been the executive director of ICUS since 1983. What has been your personal experience as director? I have actually been with every ICUS since 1976, when I first worked as a driver. Since then, I've seen many miracles happen. At this year's VIP dinner I sat next to a participant with whom I had had an interesting experience during my first ICUS -- as it turned out, his first ICUS as well. I reminded him that I had driven him from the airport to the hotel and he had been very critical and pessimistic about what he was about to experience. He laughed and said, "Oh, you were the one!" Later he testified to the other participants that he had grown through ICUS with me, since our courses started at the same time. It is true that we have both changed in amazing ways since that first time, and I feel very close to him now. His name is Richard Rubenstein. On a more external level, as conference director I have learned how to organize complex meetings and conferences. I would like to develop an "ICUS Handbook," a manual on how ICUS organizes conferences! Internally, I have gained an incredible amount from my experience with the professors. In ICUS I have learned what it means to love others as my own family -- to love elderly people as my own parents or grandparents, and to love people near my own age as my own brothers and sisters. My wife and I are developing bonds of heart with many of the participants that will never dissolve. Some skeptical people say that ICUS has a "hidden agenda." It is true; ICUS does have an agenda, but I wouldn't say it is hidden. Father has asked the staff to not only make sure that the themes of ICUS are addressed but also to inherit the knowledge, the traditions, and the culture of these scientists -- our elders -- who have worked so hard for so many years for their scientific achievements. I remember that Father told us when I was at the Seminary that our responsibility as students is to inherit our teachers' foundation and then become greater than they are. Father wants this for us so that we can enhance the lives of the next generation. This opportunity for inheriting these scholars' wisdom and knowledge is, I would say, a definite agenda of ICUS. I have learned a lot from many of the ICUS participants, by personally visiting them around the world. They have invited me into their living rooms and prepared meals for me. My purpose is to come and talk about their committees, but they often share with me their deep insights about their personal beliefs, aspirations, and concerns about life. How often do students in universities have this kind of experience with renowned professors from all over the world? Question: How is Father guiding ICUS now? After each conference Father always says that we did a good job, but then he chastises us for not doing enough. Every year Father gives us one more challenge to accomplish -- something that will bring us closer to his core idea for ICUS. There is always something that we had not thought of or did not quite fulfill. So with his guidance every year, Father refines and builds on our understanding of what ICUS is all about. Question: Have you made any mistakes that you have learned from? I am sure there are many, but there is one mistake I seem to make every year. I do not always believe 100 percent that I can fulfill Father's expectations. Every year Father asks for something that, to me, seems far beyond what the participants can accept. My tendency is to be too cautious. Of course, I am always proven wrong. This year, however, I am personally determined to witness to the participants more about the Principle and the potential and vision of ICUS. The participants who have been with us a long time know basically what we believe. Many of them have ex- pressed interest in learning more about the Principle and our lifestyle. I have to make a goal this year to teach and share with them more. Question: Have you had any special experiences with True Parents? Our greatest blessing in ICUS is our opportunity to have some very intimate experiences with the True Family. 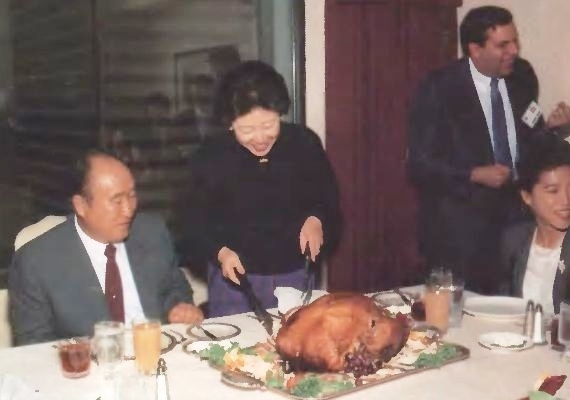 Several times I have been invited to share a meal with Father and Mother. In such a setting Father might ask me questions, give direct advice, or ask me to report; or we may talk and sing songs. It's been an important opportunity for me to learn how to give Father a report that is inspiring yet realistic, humorous as well as serious. During ICUS I am always taking notes in preparation for meeting Father. Our moments spent with True Parents at ICUS have a real family feeling. All human emotions are expressed and experienced when we are with them. I wish all brothers and sisters could have these experiences with Father and Mother. It was remarkable to have turkey dinner with them in their suite on Thanksgiving Day. Father had the knife and was ready to begin cutting the turkey, when Mother took the knife from his hand and began carving the turkey instead. Then she took a huge drumstick and placed it lovingly on his plate. It was really very cute. I sense that Father wants to expand this family feeling to ICUS as a whole, which he especially tries to do at the Farewell Banquet. This last time, Kevin Pickard, David Eaton, and I planned a banquet program that would create for the participants a truly warm, congenial mood. The entire staff felt we had to do everything possible to accomplish that. In the end, the food, the environment, the music, and Father's farewell remarks proved to be the perfect combination to produce a genuine family atmosphere. At one point I had an opportunity to tell Father and Mother that I want to understand them as parents. I told them how a few years ago I had a chance to be with Hyo Jin Nim, and that we had talked about our relationship with Father. I told Hyo Jin Nim that I envied him because he knows Father as his father. He said that he envied me, because I know his father as the Messiah. He said, "When you are too close to the tree, you can't get the whole picture or see how valuable it is" I feel Hyo Jin Nim has now succeeded in knowing Father and Mother as both Messiah and as parents. Now we have to become as loyal, dedicated, and absolute in our love toward them as Hyo Jin Nim is, by seeing them as our own parents. I told Father and Mother that I wanted to combine both aspects of knowing them and become more like a son, as Hyo Jin Nim is. Hyo Jin Nim gave an inspiring testimony to the scholars at the VIP dinner, and he also sang a beautiful song. He told them that from his experience as a college student, he sees there is no focus or any value system for his generation, and he deeply respects the scientists at ICUS for their commitment to help provide a guiding direction for the next generation. He expressed his appreciation to them for being willing to follow and fulfill Father's vision and hope for ICUS. The participants were very moved. Much of what I have said here seems to reinforce in my own mind that we are truly in the "children's course" This requires us to take more responsibility for our missions and to encourage those with whom we work to do the same. In many ways, this past ICUS provided evidence that many of the scholars are already doing this. Father's challenge now is for us to be determined to keep up with these scholars, who are themselves "on fire" to see that ICUS fulfills its overall goals. Father says that we may find ourselves outdone by their dedication and willingness to accomplish their responsibility! I can only say that it is a blessing to be in a position to keep up with, learn from, and even guide so many committed scholars who have become a vital part of the ICUS family.